BCDB Rating: "Pokémon The 4th Movie" has not yet received enough votes to be rated. This page has been viewed 45 times this month, and 3088 times total. Cartoon Characters: Ash Ketchum, Pikachu, Misty, Brock, Togepi, Pokemon Trainer, Sam, Celibi, Professor Oak, Diana, Diana's Grandmother, Tyrannataur, Raticate, Scyther. Team Rocket: Jessie, James, Meowth, Wheezing, Wobbafet, Pokemon Hunter, Iron Masked Marauder, Bayleaf, Onyx, UrsaRing, Teddy Ursa, Charmander, Ceazzor, Sneezor, Noctowl, Butterfree, Sweetcoon, Spearows. Vocal Talent: Veronica Taylor (Ash Ketchum), Addie Blaustein (Meowth), Rachael Lillis (Misty Williams, Jesse), Ikue Ootani (Pikachu), Eric Stuart (Brock Harrison, James Morgan). Produced By Yukako Matsusako, Takemoto Mori, Choji Yoshikawa. Producer, US Version: Kathryn A. Borland. Executive Producers: Takashi Kawaguchi, Masakazu Kubo. Executive Producer, US Version: Norman J. Grossfeld, Alfred Kahn. Edited By Yumiko Fuse, Toshio Henmi, Yutaka Ita. Supervising Sound Editor: Maddy Shirazi. Assistant Sound Editors: Eric Strausser, Dan Fulton. Do you have anything to add to this page? 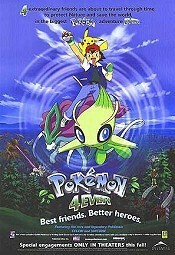 Have we made any mistakes... or do you have any additional information about Pokémon The 4th Movie? If so, we would love to hear from you. Please send us a quick note with your additions or corrections to this page, and we will make the corrections as soon as possible! 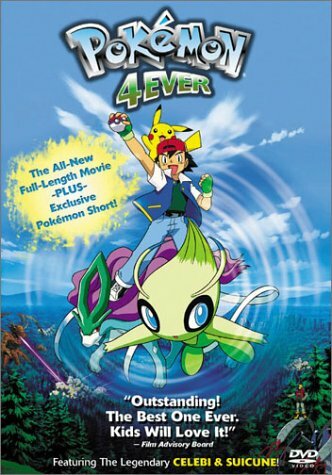 Do you love Pokémon The 4th Movie, or do you think it is the worst cartoon ever? Let us know what you think! Surely you have an opinion... so share what you think. Take a minute and post your own comments about this cartoon here. Pokémon The 4th Movie by Big Cartoon DataBase is licensed under a Creative Commons Attribution-NonCommercial-ShareAlike 4.0 International License.